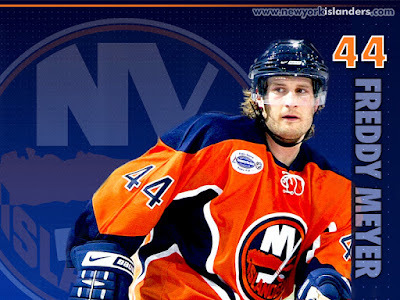 Islanders Website: Announced the club reacquired Freddy Meyer on re-entry waivers Saturday. "The injuries we've recently had on our blue line prove you can never have enough depth," said Snow. "We've always liked Freddy. He's an intense competitor and he's a very solid defense man in all areas who is still just 26 years old. We only lost him earlier in the season because of a numbers game. We are very happy to have Freddy back as an Islander." Newsday: Greg Logan updates his blog on the specifics regarding Meyer's contract obligation and injury update on Aaron Johnson and Bryan Berard. Timing is everything in these situations and the timing was right now to reclaim Meyer. A short time ago Thomas Pock was available and cleared waivers but before Aaron Johnson was injured. Now Johnson is out, Berard will likely return within the week but you look at the Bridgeport NHL depth after that and there is not much in that department beyond Drew Fata and Mark Wotton. As a re-entry waiver Phoenix will pay part of Meyer's contract.